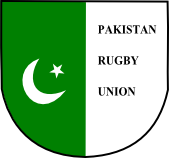 The Pakistan national rugby union team represents Pakistan in international rugby union. Pakistan is a member of the International Rugby Board (IRB), and have yet to play in a Rugby World Cup tournament. As of 2012, they will play in Division IV of the Asian championships, having been relegated from Division III in 2012. In the 19 March 2012 IRB World Rankings, Pakistan, along with Mexico and Philippines, were listed for the first time, entering with the base rating of 40 points (which positioned the three national teams in 71st place). The Pakistan national team made their international debut in a match against Sri Lanka in 2003, losing 75-3. They won their first match in 2006 against Guam by 27-22. Since their first match, Pakistan have played a total of 20 matches, with only 4 wins and 16 losses. Pakistan rugby sevens made its international debut at the 2014 Asian Games in Incheon, South Korea, in the highly competitive Pool B with matches against China, Hong Kong, and the Phillipines. Pakistan play in green jerseys with gold and white trim, manufactured by Teejac Sports.